Double Peony Ring keeps peony braches and blooms from falling to the ground. Powder-coated green for lasting beauty. 36in H legs x 18in diameter rings. Collapses for easy storage. 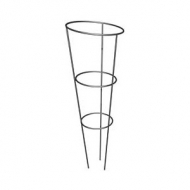 Grow-through ring supports flowers and vegetables. Powder-coated green for lasting beauty. 30in H legs x 20in diameter ring. 3.125in square grids. Peony Ring keeps peony braches and blooms from falling to the ground. Powder-coated for lasting beauty. 24in H legs x 14in diameter rings. Collapses for easy storage. 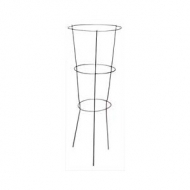 Galvanized round tomato cage 42 inch with 3 rings and 3 legs. Top ring diameter is 12 inches. 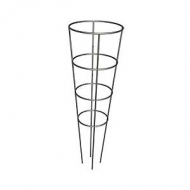 Galvanized promotional tomato cage 54 inch with 3 rings and 3 legs. Top ring diameter is 16 inch. 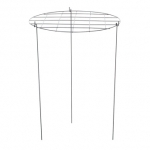 54in high x 16in diameter, use to support vegetables, shrubs, etc. 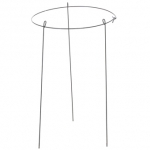 4 rings and 4 legs, heavy duty wire. Made of galvanized steel. 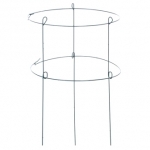 33in high x 12in diameter, use to support vegetables, shrubs, etc. 3 rings and 3 legs, heavy duty wire. Made of galvanized steel.